“Always striving to be one of the most progressive and creative Festivals in the world, The Great Lakes International Film Festival The Great Lakes International Film Festival strives to serve the interests and needs of Independent Filmmakers world-wide by connecting artists with audiences, exhibiting and promoting new films and filmmaking talent, as well as nurturing a creative community by facilitating relationships that last well beyond each year’s festival. The passion and commitment that each filmmaker and writer puts into his or her work is both noble and unique to say the least, and deserves to be acknowledged. As not only the cornerstone of our Mission, but as a general course of operation we seek out, acknowledge and award the many talented independent filmmakers who may not get the recognition they richly deserve. Considered among most popular film festivals in the world, the 17th annual Great Lakes International Film Festival genre categories for feature length and short length films are Documentary, Experimental, Religious/Spiritual, Animation, Comedy, Horror, with Horror sub-genres that include Supernatural, Thrillers, Wicken, Magical, Slashers, Science Fiction, Suspense, Horror Documentary, Horror Animation and all genres of Music Videos and GLBT films for the 2018 festival. The 2018 Great Lakes International Film Festival will accept all forms of Religious, Christian, and Spiritual films including African, African-American, GLBT, Black, Hispanic, Islamic, Latino, Native/Aboriginal and student films from the United States and around the world. In addition to awards presented to Filmmakers for Best of Genre, our Festival will present an Audience Award to the Filmmaker whose film is the most popular with our attendees, and that receives the most attendee votes. Showcasing the best films of the 2018 season, the Great Lakes International Film Festival will be held LIVE in the great city of Erie, Pennsylvania starting on September 20th, 2018, with our virtual festival taking place September 20th thru September 29th, 2018. Though the GLIFF success does not come from an excess of big names celebrities crowding its red carpet, but instead from a formidable catalogue of exceptionally high caliber Independent Films and career launches, still, over the years we have had many films that have screened on the Sundance Channel, IFC, PBS and HBO along with countless filmmakers who have received distribution deals after screening in our festival. Since our inception, the Great Lakes International Film Festival has showcased more than 1,700 films, and has played host to countless celebrities such as actor, writer, producer Bill Hinzman of Flesheaters and Night of the Living Dead; director Lloyd Kaufman of the Toxic Avenger films, Pot Zombies, and President of Troma Films; actor Gunnar Hansen of Texas Chainsaw Massacre; actor and director Mark Borchardt of American Movie and Coven; Erick Rodgers (Writer of NYPD Blue); best-selling mystery author Jamian Snow (Shrouded Insanity); John Hancock (“Hill Street Blues”, “The Twilight Zone”, & California Dreaming); actress and “Scream Queen” Debbie Rochon (Blood Relic, Vampyre Tales, & Lord of the Undead); Bobby Logan (Meatballs 4 & Repossessed), along with so many more. As one of the premier film festivals worldwide, the Great Lakes International Film Festival held its inaugural festival in the fall of 2002, welcoming internationally acclaimed celebrities like Dirk Benedict, best known for his work on Battlestar Galactica and A-Team, along with Hollywood script guru Harri James who worked as script supervisor for blockbuster films and TV Shows as ER, Alias, Tremors II: Aftershocks, and Tremors 4: The Legend Begins, to name only a few. That same year, B.J. and the Bear & Up in Smoke producer, Otto Felix visited the festival along with the renowned Keith Carradine being presented with a lifetime achievement award for his dedication and contributions to indie film. Since that time, the Great Lakes International Film Festival has had many films go on to greatness like “The Derby Stallion” that was released through Echo Bridge Home Entertainment, a subsidiary of Disney, and Director Joel Miller’s film “The Still Life” that received distribution through Warner Home Video after having been screened at the festival. In 2004, the Great Lakes International Film Festival had the proud pleasure to present the North East United States Premiere of “SAW”, Lions Gate Films’ gripping psychological thriller starring Cary Elwes, Danny Glover, Monica Potter and Leigh Whannel. The legendary Terry Moore was our special guest of honor and was presented with a lifetime Achievement Award for her amazing accomplishments in film over the past 60 years, while international recording superstar Dizzy Reed of Guns ‘N Roses performed before a capacity crowd at our Film Festival. That’s right, we’re off to La La Land for our first Film Festival of 2018! 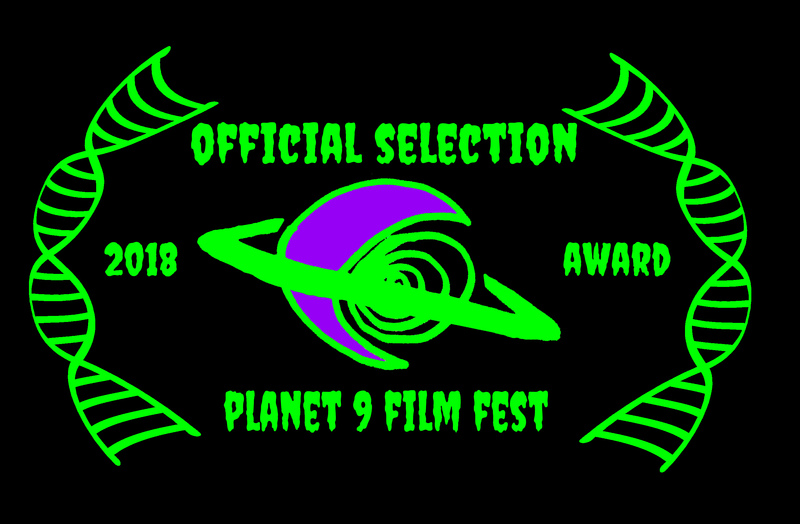 Our latest and greatest film “Time Free Dentistry” is an Official Selection to The Planet 9 Film Festival and will screen on Saturday, October 6th. The Planet 9 Film Festival is an independent festival that features unique & interesting films made by people from all over the world. The festival focuses on themes of originality, sci-fi, horror, experimental & consciousness. The festival was created by indie filmmakers as a means to build community & connection among lesser known indie/DIY filmmakers. It is for the Under-the Underground. This years festival will take place in THREE cities this October! Each Event will be hosted by Special guest: Count Cat! There will be costume contests, various awards & prized for select film winners, live music & more! The event will be recorded & streamed on “Pixelated Something Contraption”, the Death Cat Internet show. We’ll keep you posted on the Event and traveling up to NoHo for the Festival. If you’re interested in going, please email me and I’ll coordinate a trip up. It’s $10 per person for the Tickets to the Festival but it runs from 7pm to 2am. We’ll probably leave Saturday morning around Noonish so we can get there in time for the Festival. Looking forward to going and hope some of you will make the trip. Screening for the film is in the process of being determined when and where so we will keep you posted on that. Until then: Remember, Life is Shorter Than You Think! And there’s actual Audio of this too for you non-believers. So here’s my question to Bob, what did you do before you became Tony Stark aka Iron Man aka Sherlock Holmes aka Dr. Dolittle (yes, he’s going to be playing that iconic role too) etc. ad nauseam? Ever make any Indy Films? Or small budget films like “Less Than Zero” or “The Pickup Artist” or the many other indies that you worked on? I guess when you become a mega-star you don’t have to take a little risk for a bigger paycheck, right? This really irks me that he would say that because those of us who are trying to make it big would more than likely not forget our struggles to make it big. I mean that you have to bleed for your Art, am I right? If you’re not then either you’re not doing it right or maybe you need to find a new career. But getting back to my point, what if you’re making it in the big time and you get approached by a small group of independent filmmakers who would like you to be in their film. Would you feel that it’s beneath you because you’re a big time star? Can you forget your roots and perhaps where you came from? Can you empathize with others who might have been in your shoes? What if you had the time and the wherewithal to make an indie even though you’re working for Marvel Studios? Or Disney? Or some other big Studio? Would you not show some loyalty to your fellow filmmaker? Do you not have at least a bit of integrity since getting to the majors and giving back a little bit? If it’s a matter of compensation (or a lack thereof) then I have no problems doing it. If the script is well-written and you have assembled a great Cast and Crew. And the potential to have a great film that you’re a part of go out into the world and hit the Film Festival circuit. Then there’s no reason not to be a part of something that could be really special. Doing what you love is it’s own reward. For what it’s worth, there are some pretty remarkable and wonderful films that came out during the 80’s as well, specifically 1982. Coincidentally, that’s the year I graduated HS, left Detroit and headed to California as I had joined the Marines. Oh to be young and full of hope and glory again. But I digress. Arguably, the movies that came out over that year were some of the greatest and influential films ever made. They were inspirational and made their way into the American lexicon for generations to come. The Dark Crystal (Jim Henson, Frank Oz) While this is considered a children’s film, it’s still one of the more beloved films from Henson and company. It inspired others and created a whole new industry in Hollywood. Porky’s (Bob Clark) Kim Cattrall, Mark Herrier, Wyatt Knight (Long before American Pie and other teen film genre movies, this was a trend setter. A raunchy and “seminal” comedy about HS kids trying to get laid. Yes, it was sophomoric and juvenile. But that’s what makes it so great because we can all lighten up, act like we’re back in High School again and forget that the Moral Majority was taking such a regressive view of sexuality during the 80’s. It was also the fifth highest grossing film in 1982. Swamp Thing (Wes Craven) Adrienne Barbeau, Louis Jourdan (This was the pre-cursor to the whole Super Hero genre that we’re currently experiencing based on the comic book in the DC universe. And it was before Craven hit gold with “Nightmare on Elm Street” and almost a decade before his other huge franchise “Scream.” It was campy and had some funny lines. I’d still love to get the rights and do a remake. Make it much darker and shoot the whole thing at night. “Saga of the Swamp Thing.” Who’s with me? Tron (Steven Lisberger) Jeff Bridges, David Warner, Bruce Boxleitner (Greetings Programs! The story arc was totally implausible but hey, if you’re going to get blasted into a Computer, why not have a cool suit to wear and ride motorcycle powered by light. Wait, wasn’t that the Sequel? Actually the sequel was a really fun film too; but I fell in love with both Tron and Tron: Legacy because they have such amazing visual effects. Back then the VFX were pretty cutting edge as is the sequel. With both Bridges and Boxlietner in the original and sequel, it was a Disney film and made bank. It’s been so long since we updated the blog here because of our work on “Time Free Dentistry” so we apologize profusely for the delay! That being said, it’s with great pleasure and pride to announce the Award of Merit from the WSTL Film Competition! Huzzah! It was announced this past Sunday that our Producer Matt Morgan and Director Alex Robles were given this accolade. Congratulations guys and well done! And, just a bit of teaser here, we have a rough print copy for the One-Sheet on TFD that we’re sharing here. It’s not telling you a whole lot nor does it give anything away. But it’s really fun to look at though! Enjoy! We had a wonderful experience on the Red Carpet this past Weekend at the SDFC 2015 Fall Film Festival. Reconnecting with all the Cast & Crew who showed up was a blast, it was so fun to see everyone and catching up with what they’ve been doing. For the World Premier of “The Brazilian Affair” we couldn’t have asked for a better night. We are very grateful to the SDFC President and High Priestess of Film Jodi Cilley and her crack staff of volunteers. Thanks Jodi, you guys Rock! So, it’s readily apparent that there are quite a few Filmmakers in San Diego who are making some outstanding films. We went Friday and Saturday and watched some wonderful films. On Friday, my girlfriend and I loved the short “Star Wars: A Toy Story” It was very humorous and the voice-over actor did some nice work as well as being well shot. On Sunday, I was flying solo and got to see some more great work by some very talented Productions. Really enjoyed watching “Acacia” and “Delivery” on Friday; on Sunday, “Right Hand Men” along with “The Checkout Club” and “Wingin’ It” were all hilarious with great cinematography and screenplays. And I thought that “Crowdsorcery” which won for Best Comedy in the Audience Choice and Jury Awards was very funny, very original and the Cast and Crew did outstanding work through and through. I also took the time to congratulate Stephen Mickelsen, Tony Cox, Raymond Montemayor, Gwen Barriac, Kelly Parks and others on the job well done. 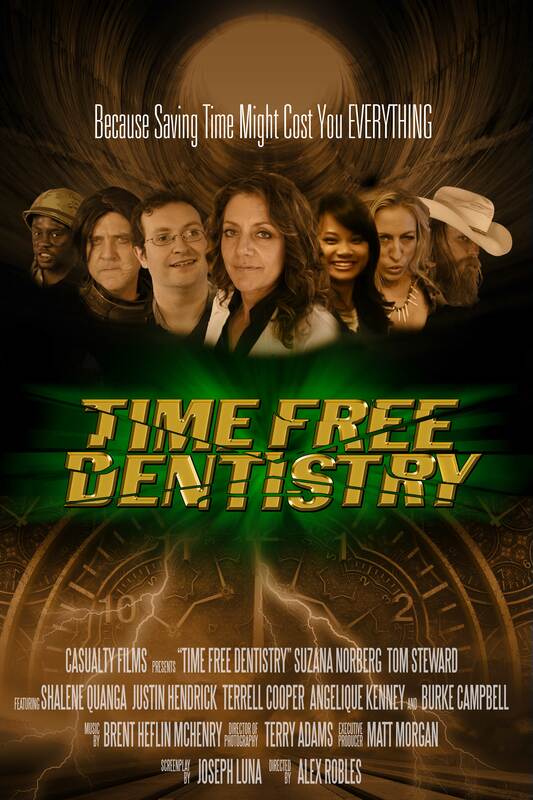 Casualty Films today announced that Pre-Production for their newest Film “Time Free Dentistry” has begun. All of the Principal Photography is being shot in San Diego. Returning to work together again as a Team is screenwriter Joseph Luna, Director of Photography is Terry Adams, Director Alex Robles and Producer Matt Morgan. Morgan also went on to say, “With our team in place, we’re starting Rehearsals in 2 weeks along with several pre-production meetings so it’s all systems go.” The film “Time Free Dentistry” is a Sci-Fi Comedy about a Dentist who experiences a horrible first day at work. He quickly learns how a small, dentist office may change the future of dentistry but unknowingly creates havoc in the office. With the use of proprietary technology, Time Free Dentistry has a device that will change the industry if not the world. Casualty Films also has the aforementioned film “The Brazilian Affair” due for its World Premiere here in San Diego, the Venue will be forthcoming in several weeks. Look for more updates coming in the near future.